Have you ever wondered how Thor got his hammer? Norse Mythology: Classic Stories of the Norse Gods, Goddesses, Heroes, and Monsters contains stories passed down from the ancient Norse religion, practiced by the Vikings and other northern people who live in modern-day Scandinavia, Iceland, and throughout the British Isles. How did Odin form the world from Ymir’s body and make men and women from wood? What are the names of the nine realms and who (or what) live in them? Why does Odin have only one eye, and why does Tyr have only one hand? Where the gift of poetry comes from? Who are Loki’s children, and why does Odin fear them? Why do the gods fear the end of the world, and what will happen at Ragnarok? In this book, you will also find many stories about the gods Thor and Loki and their exploits in the land of the giants. You will hear the story of the dwarf Andvari and his golden ring - the myth that is the basis for Robert Wagner’s famous opera The Ring of Nibelung as well as J. R. R. Tolkien’s Lord of the Rings trilogy. And, in these pages, you will find the story of the mortal hero Sigurd and his battle with the dragon Fafnir. Whether you are new to Norse mythology or looking to dive into the rich, fantastical world, Norse Mythology: Classic Stories of the Norse Gods, Goddesses, Heroes, and Monsters is the place to start! As an Asatru heathen, I follow the old Gods. Books about the old Gods vary in interpretation. This book is no exception. I'm not sure how much research Scott Lewis did prior to writing this book. The reason I say this is because in several of the tales, Lewis leaves out what I consider to be important elements of the story. For example, in Lewis' version Thor and Loki travel together seeking giants. They come across the giant who eventually uses trickery to show them humility. However, Lewis left out half of the tale. I'm referring to when Thor and Loki stop in at the farmer's home. The farmer's son cracks the bone to one of Thor's goats.... anyways you see what I mean. Also Lewis'version of how Loki was captured and bound was not accurate at all. I did enjoy the tale of Sigurd. This is not a tale that is common in most other "Norse Mythology" books. Unfortunately, Lewis ends the tale stating that is a story for another day, but then doesn't tell the reader/listener where to find the rest of the story. The narration I found lacking. The narrator simply read the book. No emotion, no passion, he just simply read aloud. If you have never read or listened to any other books about the Norse Gods, then I would suggest finding another book. If you have read or listened to other books and want a different point of view, then I guess this might be a good fit for you. I requested this review copy free of charge and have voluntarily chosen to leave a review. A great way to learn about a culture that very few us have any knowledge. The Narrator did a good job with the material and gives the listener the ability to absorb these stories. A good introduction to Norse gods,goddesses,etc.Madison Niederhauser was a fine narrator.I was given this book by the narrator,author or publisher free for an honest review. I was given this free review copy audiobook at my request and have voluntarily left this review. 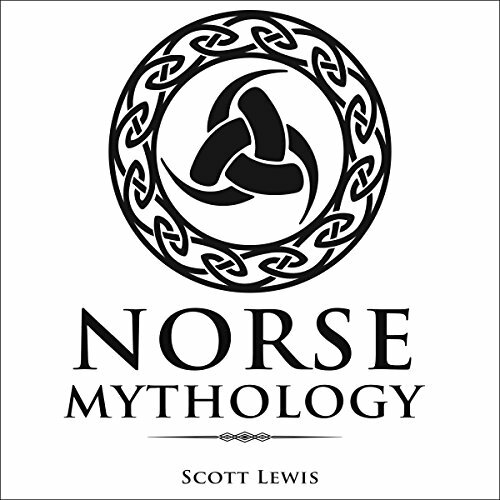 This review is for the audio copy of Norse Mythology: Classic Stories of the Norse Gods, Goddesses, Heroes, and Monsters Classical Mythology, Book 3: by Scott Lewis and narrated by Madison Niederhauser. I asked for this book because I love mythology stories. This book presented short, easy to listen to and enjoy stories from the Norse culture. I recommend the book and the narrator. This excellent collection covers the Norse tales from the creation of the world to Ragnarok including stories of Odin, Thor, Loki and all the other gods. Well written and well read, they are brief enough for traveling and interesting enough to keep you coming back. Though not a complete collection they provide an excellent introduction to one of the worlds great mythologies. This book is an interesting introduction to Norse Mythology. It gives listeners a quick glance at some of the gods and goddesses in Norse Mythology and some of their adventures. The book does not go into any depth about the mythology but whets your appetite for more. This book moves along quickly and highlights some of the main stories in the Norse Mythology. It is a good way for those interested in the Gods of the Norse Mythology to see if they want more. I didn't actually listen to this title myself. My daughter did, as she is a fan of Norse mythology. She loved it and said it did an excellent job telling the stories of the various gods. She will probably listen to it again. Norse Mythology: A great collection of Norse tales, Listen and be inspired. I found this book to be a great listen, and it will go into my re-read. Narration is superb and I look forward to this book on a cold winters evening in front of a roaring fire, a perfect setting for Norse tales. I was given a free copy of this audiobook at my own request and voluntarily leave this review. Why Thor's hammer has a short handle. I received this book in exchange for an honest review. This was a short telling of some of the most important of the Norse Legends. I wish it had gone a bit deeper but if you are interested in finding out more than you do in a Marvel movie this is a good place to start. At first, I was frustrated by the narration which seemed stilted but I soon realized that it was just the way it was written with a glossary at the start of the book.As it went along it got a lot better.